From the Archives: God Is Sovereign! Of all of the theological issues that have arisen in the last couple of decades, the matter of what God is like has to be one of the most crucial. As A. W. Tozer has written, “[T]he most portentous fact about any man is…what he in his deep heart conceives God to be like. We tend by a secret law of the soul to move toward our mental image of God” (A. W. Tozer, The Knowledge of the Holy, 7). Of course, all orthodox Christians agree that God is a Trinity, three persons in one essence. But just how powerful is this God? Does He control all things, even the details of life? Does He even know all things past, present, and future? Some evangelicals seem to be unsure. Read more about From the Archives: God Is Sovereign! Genesis 6:6—God is sorry and grieves. The LXX uses the word enthumeomai, which is simply to consider or think about, not to “be sorry” (See Matt 1:20). The Hebrew nachem is to have sorrow or to console oneself. Clearly God has emotional responses to the deeds of men. Still, this gives no indication of what God did or did not know beforehand. If He wants to have foreknowledge and still be saddened by what takes place, does He not have the right to do that? Or is He only allowed to express emotion if He follows the rules of open theism? Genesis 8:1, 9:15-16 (and Ex 6:5)—God’s remembering is not indicative of His otherwise forgetting. Rather it points to a return to focus of that which is remembered. God didn’t forget Noah or the covenant. To assume that God’s remembering requires His first forgetting demands the presupposition that God has the same limitations as humanity. 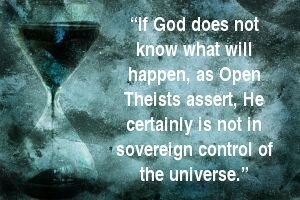 To use God’s remembering as an argument that He forgets or does not know, requires presupposing that the premise of open theism is correct before examining the biblical data. The problem of evil presents a challenge for philosophers and theologians who hold to the existence of God. Simply stated, the problem includes three conditional premises and a concluding question: If God is all powerful, all knowing, and all beneficent, then how can evil exist? In order to resolve the problem that the concluding question implies, one of the three premises has to be denied or altered. While I would suggest that the problem can only be resolved by understanding and defining the beneficence of God through the lens of His holiness (as emphasized in Isaiah 6 and Revelation 4), the theology of divine openness, otherwise known as open theism, attempts to answer the question by denying the other two premises. Open theism is on the extreme end of the “free-will” spectrum as a philosophical attempt at resolving the problem. This is the second half of an article by Dr. Myron Houghton which appeared at SharperIron (in four parts) in June of 2005. Part one ended with a look at the fifth of Gregory Boyd’s eight evidences that God changes His mind. Part two continues by addresessing the sixth. e. God tests people to know their character. Read more about God Is Sovereign!